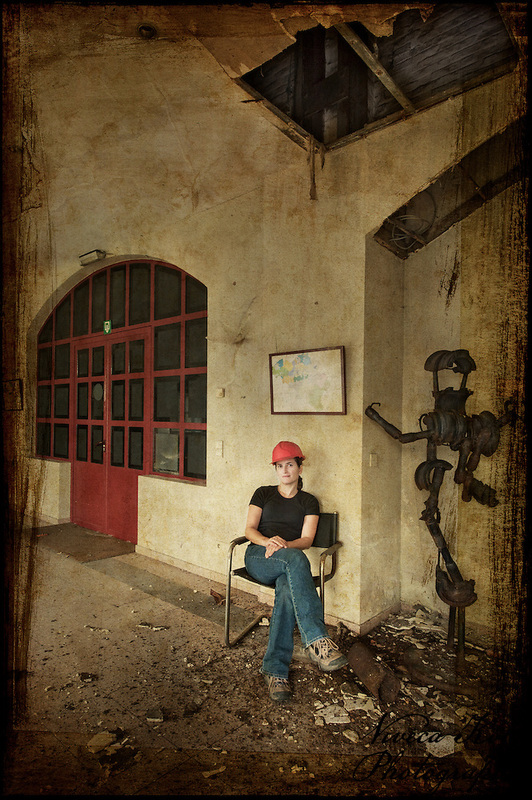 Here I am in a borrowed hard hat at the museum attached to the abandoned ECVB powerplant in Belgium. It was completely un-vandalised which was refreshing to witness, and all the crumbliness around me was simply the gradual and inevitable decay of a derelict building just giving in the the advances of time. I’m not sure what the metal ‘sculpture’ by my side was meant to be, but it looked to me like a weird and contorted dancing figure, hence the title of this photograph. This was shot from a very narrow platform overlooking the main hall of the museum, and provided a great vantage point from which to see everything that was there. I have no idea what the rusted metal object on the ground floor might be (look, I’m a girl, I don’t know this kind of stuff), but it reminds me of a large metal robot, a rather unsophisticated cousin of the kind one might see in ‘Transformers’. 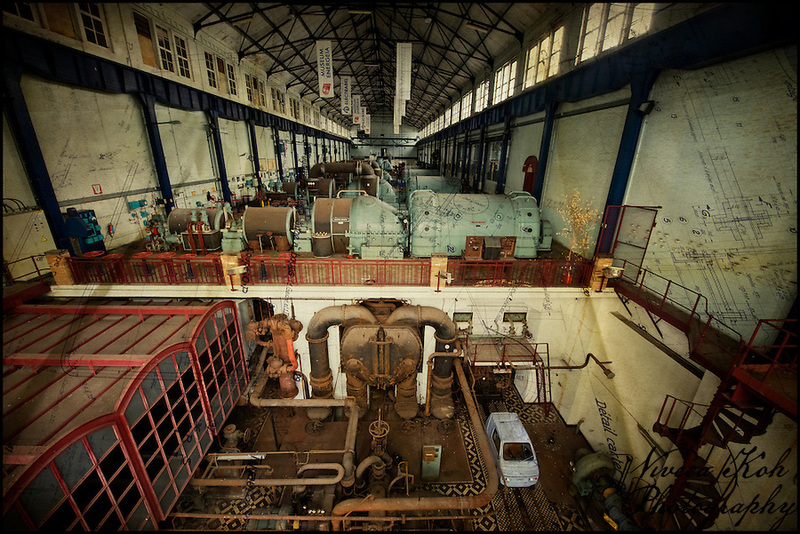 I have overlaid this photo with a plan found in the office in the turbine hall. There were many papers and documents to be found within, and I was very happy to be able to add quite considerably to my textures database while I was there. I will probably use more of these plans in other unrelated shots in future, but it’s nice to be able to use some in context with the actual place of their origin. Finally, I had to shoot another self-portrait in this dinky little vehicle, which was complete with various levers and switches to flick (which naturally I did – who would be able to resist such a thing?) and a surprisingly comfortable seat. Not sure what it would have been used for at the powerplant however – any thoughts? This entry was posted on Thursday, October 13th, 2011 at 19:22. It is filed under Industrial, Urban Exploration and tagged with abandoned, Belgium, Digital Image Manipulation, photographer, portrait, powerstation, self-portrait, texture, Textures, UE, UrbEx. You can follow any responses to this entry through the RSS 2.0 feed. Nice set of images – not sure that the hard hat suits though! Really like the diagram overlay on the middle shot – nicely done. Great work again Viveca, love the overview shot with the textures!